Welcome to April as my trainer friend, Kenny Grant would say! I hope everyone had a great Easter or Passover (Pesach). This month's fitness challenge has begun and we are rolling out the workouts to get you ready to ace the final. Our workouts will consist of two circuits, and will get progressively more challenging each week to help you achieve your fitness goals. Start with a brief 5-10 minute warmup, and then let's rock and roll! Complete this circuit four time, before moving on to the cardio portion of today's workout. For April, we will be eschewing a great deal of traditional cardio. Today, for our cardio, we are doing two sets of 50 reps of hip swings. April is upon us, and with it, there arises another opportunity to take your fitness to new heights. It's time for you to spring into action and take our April Fitness Challenge. Perform better! Feel better! Look better!! April's challenge is going to be awesome, and by following the workouts you will get even stronger, leaner, and fitter. pushup test- complete as many as you can without stopping. squat test- do as much weight as you can for 8 reps. Happy Monday! We are beginning testing today, and continuing through Sunday, for our March Fitness Challenge, so there is no workout of the day for this week. Good luck and email me your results at bob@bobwellsfitness.com and I will publish the top scores on our leaderboard. Have a great workout! For those celebrating Pesach (Passover), have an awesome seder tonight and Chag Kasher V'Sameach! Welcome to Friday and the workout of the day! Testing for the March Fitness Challenge begins Monday, so let's finish the week strong! Complete the above circuit four times, then move on to the next circuit. Complete this circuit four times as well. Now, do 30 minutes of cardio (e.g. run, bike, swim) at a medium intensity. Good luck and enjoy the workout and your weekend! High Intensity Interval Training, or (HIIT) for short, has become all the rage for people looking to spice up their dull cardio routines and get leaner than they have ever been before. HIIT is a training protocol that involves periods of maximum effort followed by active rest. For example, you could sprint as fast as you can for 60 seconds, followed by walking for 60 seconds, then repeat. Such a workout could be completed in 30 minutes or less. "One of the earliest studies, done by researchers at Laval University (Ste-Foy, Quebec, Canada), kept it basic, using two groups in a months-long experiment. One group followed a 15-week program using HIIT while the other performed only steady-state cardio for 20 weeks. Proponents of steady-state training were pleased to hear that those subjects burned 15,000 calories more than their HIIT counterparts. Those who followed the HIIT program, however, lost significantly more body fat. A 2001 study from East Tennessee State University (Johnson City) demonstrated similar findings with subjects who followed an eight-week HIIT program. Again, HIIT proved to be the better fat-burner–subjects dropped 2% body fat over the course of the experiment. Meanwhile, those who plodded through the eight weeks on a steady-state program lost no body fat." Another advantage of HIIT, according to Jerry Yuhara, CPT, PES of Breakthrough Personal Training in Palo Alto, CA is that there is more of an anabolic, or building, effect on cells. With HIIT, there is a bigger increase in testosterone and growth hormone than in steady state cardio. These anabolic hormones promote fat loss and muscle gain, which results in the leaner look we are seeking when we do cardio. Below is an example of a HIIT routine, created by Simply Shredded. If you are a beginner, you can modify the time, doing 30 seconds for each sprint. Try this at least 3x a week and "fine tune your fat fighting machine. Repeat walk/sprint cycle 12 times. Despite this and other research showing the benefits of HIIT over steady state cardio, everyone is not sold on it as a superior method of fat loss. Belgium trainer Mehdi Hadim, (pictured left) "The New Muscles from Brussels", points out that in 30 minutes of HIIT, he burns 324 calories vs. 481 calories during 45 minutes of steady state cardio. Since weight loss is a simple mathematical formula--burn more calories, lose more weight--steady state cardio proves superior in this aspect. While there is no disputing this simple fact, there is a bigger picture to consider. Sustained aerobic activity leads to an increase in the hormone cortisol, a catabolic agent that can wreak havoc on your body. Excessive cortisol breaks down muscle tissue and slows down your metabolism as a result of this muscle loss. Your weight loss comes at a steep price. This destructive nature of steady state cardio is why weight training is superior to cardiovascular training for fat loss. This is despite the fact that you burn more calories in one hour of cardiovascular training than you do in one hour of weight training. Losing fat and building lean muscle tissue are about altering your body composition via strength training and HIIT. Are there exceptions? Of course there are. However, in general, HIIT is the way to go to get the leaner body you want and deserve. Complete the above circuit three times, with less than 60 seconds rest after each round. Then move on to circuit number two. Complete the second circuit three times, resting less than 2 minutes at the end of each round. Then, move on to the cardio portion of today's workout. For today's cardio, we are doing 30 minutes of high intensity interval training (HIIT). Alternate between 15 seconds of work and 15 seconds of active rest, until the 30 minutes is complete. Enjoy! Special thanks to Kathleen Monteleone (star of Broadway's Hands on a Hardbody), Laura Fisher, and Ashley Castle for demonstrating today's exercises. It's finally Friday! It's time for the weekend and the workout of the day. I hope everyone had a great pi day yesterday. Now, let's go to work. Complete the circuit above four times, with as heavy a weight as you can safely do, resting for 1-2 minutes after each circuit as needed. Complete this circuit three times, resting up to three minutes after each round as needed. 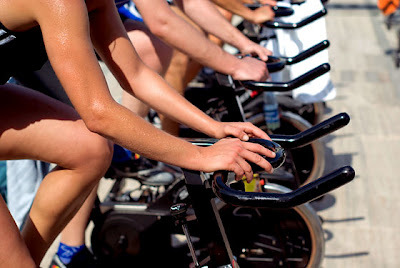 For today's cardio, we are going to do some HIIT, high intensity interval training, for a total of 20 minutes. Go as hard as you can for 40 seconds, followed by a 20 second active recovery in which you are running or pedaling at about half speed. Repeat for 20 minutes, then finish with a five minute cool down. Enjoy your workout and have a great weekend! Welcome to Wednesday and the workout of the day! Let's spring into the workout and get your soft tissues (e.g. muscles, tendons, ligaments) warmed up. Try this warmup or some Animal Flow exercises, such as underswitch, crab stretch, scorpion, or kick through. Complete this circuit five times, resting 30-90 seconds at the end of each circuit. Do four sets of squat thrusts, resting 30 seconds after each set. After you have completed both circuits, do 30 minutes of cardio at a medium intensity. You should be able to talk, but not read a newspaper. Good luck with today's workout! It's Monday and time to start the week off right with the BWF Workout of the Day! Grab some weights and bring your A game! It's time to rock and roll! First things first, we have to get warmed up. Try this warmup or some Animal Flow exercises, such as underswitch, crab stretch, scorpion, or kick through. Complete the above circuit three times, with 60 seconds rest at the end of each round. Complete this circuit 4 times, resting 60-90 seconds after each round. Good luck and happy Monday!! Special thanks to Broadway star, Kathleen Monteleone (Hands on a Hardbody), Equinox's Herman Soto, and Ashley Castle for demonstrating the exercises. Welcome to Wednesday and the Workout of the Day. Enjoy and good luck! Do the above circuit three times, resting for 60 seconds or less at the end of each circuit. Complete the above circuit three time, also resting for 60 seconds or less at the end of each circuit. After completing both circuits, do 15 minutes of cardio at high intensity intervals. Do 40 seconds as fast as you can, then 20 seconds at low intensity for quick recovery. Congratulations to all who took our February Fitness Challenge and pushed themselves to greater heights! Let’s take it up another notch with our March Challenge. Each of the above tests is meant to be done as quickly as possible. Check out our "Workout of the Day" section for workouts to get you leaner, stronger, and ready to ace the March Challenge. Good luck!